A new little buddy was added to the Joseph family this week, but it’s not what you think. We are not pregnant, though that is never out of the question for us. 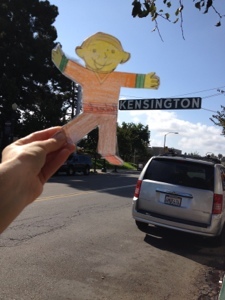 We are helping a friend with a school project and taking care of a little Flat Stanley for a bit. He is a cute little buddy and he fits so neatly in my journal and purse. It’s been fun to take him around San Diego, this little cardboard companion of mine. But this little pocket-sized fella has also been challenging me this week. I was kicking myself the whole 3 hour drive to the mountains near Big Bear, California for leaving him in Phin’s diaper bag. He would have loved those views, the old-school Smokey the Bear signs in the National Forest, and the music on the road trip. I seriously felt as guilty as if I had inadvertently left my own child at home. But my guilt issues are a story for another day. God has also used this yellow-faced little paper boy to cut me to the quick this week. As I was conveniently toting this Flat Stanley around with me this week, the Lord convicted me that often I want to make Him a flat God. Fit tidily in your pocket. To wear in your locket. My way is not so static. I sent my only Son as man. purpose in no other name. more than words on a page. You must know my Son well. He has wonders yet to tell.